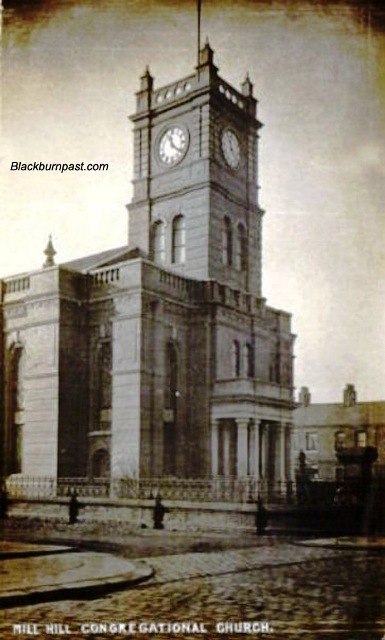 As it says on the photo, this is the Congregational Church at Mill Hill, which stood on the New Chapel Street end of New Wellington Street. The foundation stone was laid on February 20th 1859 and the church opened for worship on Sept 19th 1860. In 1920 a black & white marble tablet was placed in the west wall, bearing the names of ''Twenty scholars who made the supreme sacrifice'' during the First World War. A roll of honour in an oak frame, no doubt bearing the names of many more local lads (and lasses?) who had fallen, was also placed in the vestibule. I've no information as to when the church was demolished, but it was probably in the 1960's. "Was erected in 1860 at a cost of £6,000 accommodated 1,000 persons. Was closed in 1962 and demolished in 1965"